The Okinawan Ryukyu Ryu Kon Kai Association has devoted itself to the practice and training of various martial arts weapons such as: Bo, Sai, Tonfa, Tekko, Nunchaku, Kama and Eku, because the association regards Kobudo as a traditional Budo just like Karate. Ryu Kon Kai Kobudo stresses the importance of the skill of perfect self defence and the power to kill the opponent with a single blow and urges it’s members to master them through the hard training of one Kata after another. At the same time, the association emphasises the importance of acquiring the mental and spiritual power – the sense of life and death – through their training. The beauty of Kata and Budo is developed into the higher level of beauty and power only through stability and smooth movement of the lower part of the body. The Katas of Karate and Kobudo are inevitably essential to Budo from the historical point of view. Up until 40 years ago, each master learned only one kata and took it to a country and taught it there. Those masters were quiet old and because they were dispersed around the island, it was quite difficult to collect the Katas of the masters. The Katas were, however, finally collected and the collection of the Katas became the foundation of the Ryu Kon Kai. 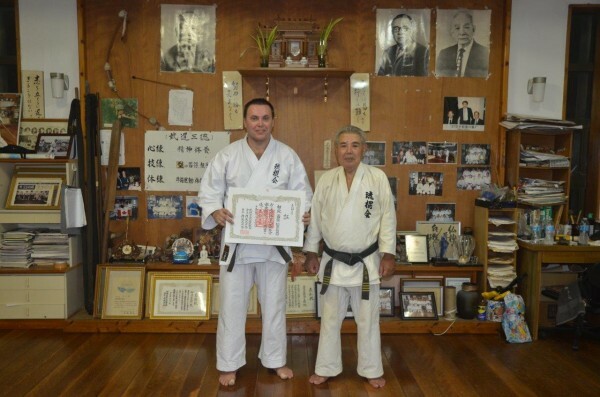 Ryu Kon Kai was first brought to Australia by Sensei Robert Slywa in 2003 after being personally trained by Grand Master Iha Kotaro 10th Dan Hanshi, founder of Okinawa Ryukyu Ryu Kon Kai. Students who train Ryu Kon Kai at Bujutsu Martial Arts and Fitness Centre, are lucky enough to train a traditional and legitimate system of karate and kobudo exactly like it is taught in Okinawa. 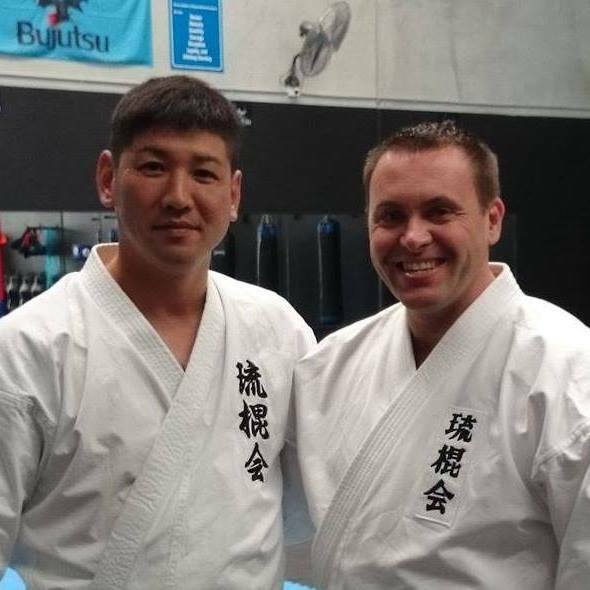 Sensei Mark travels to Okinawa two times a year where he trains with Grand Master Kotaro Iha and Master Mitsutada Iha. Sensei Mark is proud to uphold the Okinawan traditions in his teachings. Sensei Mark regularly takes students with him to Okinawa (the birth place of karate and kobudo). His students really enjoy these trips and the experience of training karate and kobudo in Okinawa. Ryu Kon Kai Dan grades are registered in Okinawa and are internationally recognised. Same as 2nd Kyu. But better understanding and execution.